Written engagingly and with agreeable humour, this book balances a light touch with a rigorous yet economical account of the theory of games and bargaining models. 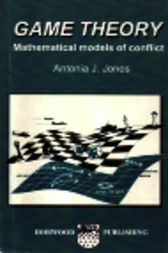 It provides a precise interpretation, discussion and mathematical analysis for a wide range of “game-like problems in economics, sociology, strategic studies and war. There is first an informal introduction to game theory, which can be understood by non-mathematicians, which covers the basic ideas of extensive form, pure and mixed strategies and the minimax theorem. The general theory of non-cooperative games is then given a detailed mathematical treatment in the second chapter. Next follows a “first class account of linear programming, theory and practice, terse, rigorous and readable, which is applied as a tool to matrix games and economics from duality theory via the equilibrium theorem, with detailed explanations of computational aspects of the simplex algorithm.